SEOUL, Jan. 18 (Yonhap) — With a number of child abuse cases rattling South Korea in the last few months, a new TV series delves into the subject by exploring mother-daughter relationships, which, according to director Kim Chul-kyu, can be the most dynamic of all human relations. The 16-episode “Mother” on tvN, the Korean remake of a Japanese TV series of the same title, will depict the complicated, multifaceted relations between mothers and daughters, the director said at a media briefing at a hotel in southern Seoul on Thursday. 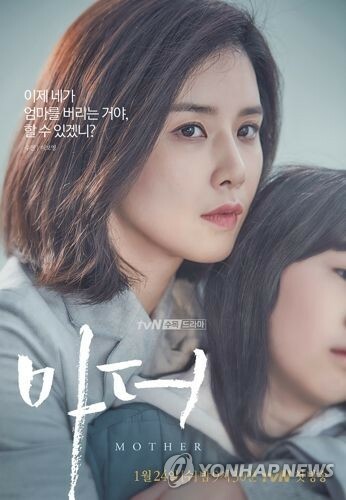 The drama centers on the relationship between cool-headed elementary school teacher Soo-jin, played by Lee Bo-young, who is determined never to become a mother due to her complex relations with her own mother, and her student Hye-na. In spite of herself, Soo-jin is drawn to the 7-year-old girl who tries to hide that she is being mentally and physically abused by her single mother. Soo-jin decides to take her troubled student with her on a trip, without telling her mother. “Since I gave birth, every child abuse case has caught my attention. I was compelled to do this drama,” Lee said, clearly having a lump in her throat. “I felt responsible for raising public awareness about such cases.” She married actor Ji Sung in February 2013 and gave birth to a baby girl in 2015. “The fact that the original drama is very good and has been very popular was a secondary concern to me,” she said. “Mother” is considered one of the most anticipated TV series this year. Celebrated screenwriter Jeong Seo-Gyeong adapted the original Japanese drama for the remake. She wrote the scripts for “The Handmaiden,” “Lady Vengeance” and “Thirst,” all helmed by award-winning director Park Chan-wook. “I was a bit overwhelmed in the beginning because I had to write 16 episodes. But once I got down to it, I realized there were enough room for me to create more stories for each character,” Jeong said. A mother of two herself, the writer said a spate of horrible child abuse incidents spurred her to take the job. But rather than talking about the evil of child abuse, she wants to put more focus on how strong and resilient the victims are. The Wednesday-Thursday drama will premiere at 9:30 p.m. on Jan. 24.